DTennis is the best 10 and Under Tennis in Lake County, Fl. 10 and under Tennis is an exciting play format for kids 10 years of age and younger learning to play tennis in Lake County, Florida. It is designed to bring them into tennis by slightly modifying the game for their age and size. - The court is smaller and easier to cover. - The net is smaller. - Racquets are made for small hands so they are easier to grip and swing. - The scoring rules allow for shorter matches. - Special balls bounce lower and slower, making them easier to hit. Balls are colored based on age and skill level. Diana Marti Belton, owner of DTennis, was among the first professional instructors to help launch the USTA 10 and under National Campaign in 2008 at Disney, and introduced the new way for kids to play tennis in the USA. She has directed one of the top 10 and under Tennis Programs in Central Florida and has been an advocate for 10 and under at tennis seminars. 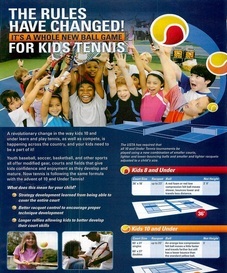 DTennis offer Kids 10 under tennis lessons throughout Lake County, Fl, including Mt. Dora, Eustis, Umatilla, Apopka, Howey in the Hills, Sorrento, Tavares, Leesburg, Lake Harrys, Altoona, Clermont, Fruitland Park, and other cities in Lake County, FL.